As a powerful and easy-to-use tool to download and convert YouTube videos, MediAvatar YouTube to iTunes Converter perfectly solved the problem of too many steps from YouTube to iTunes for you. With MediAvatar YouTube to iTunes Converter, you can finish all downloading and converting YouTube videos to iTunes in few clicks, and then sync them to your iPad, iPod or iPhone easily. All formats compatible with iTunes are supported. It is so simple to enjoy the YouTube videos on your Apple devices. Try the free download now! It only needs few clicks to download and convert YouTube video to iTunes in H.264, MPEG-4 or MP3 format with MediAvatar YouTube to iTunes Converter. 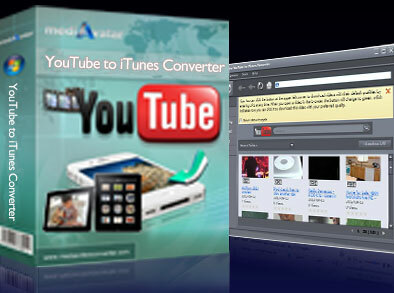 Get the YouTube FLV files to PC and the converted videos to iTunes at a time. It also supports to convert FLV files from local disk to other formats. With MediAvatar YouTube to iTunes Converter, it's convenient to download and convert several YouTube videos in batch simultaneously. All iPad, iPod and iPhone formats, and the latest iTunes 10.6 are supported. Downloading and converting YouTube videos could be started from IE's right-click menu or the built-in browser directly. With Multithreading and batch conversion, it's so easy to download and convert YouTube videos at high speed. You can download the YouTube videos via proxy server by setting up the proxy data. Download speed, priority level and max simultaneous tasks are all could be set at will. English, German, Japanese, French, Italian, Spanish, Simplified and Traditional Chinese are available.